Riding an ATV will provide your kid with the opportunity to learn new things, develop specific skills, and spend time in nature exploring new places. 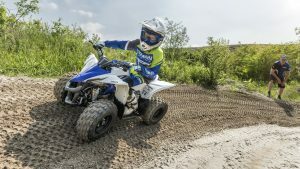 If you’ve decided that your kid is old enough to try the ATV experience and you’re on the lookout for such a vehicle for your young rider, you need to keep a few things in mind to make sure this experience will be a safe and enjoyable one. 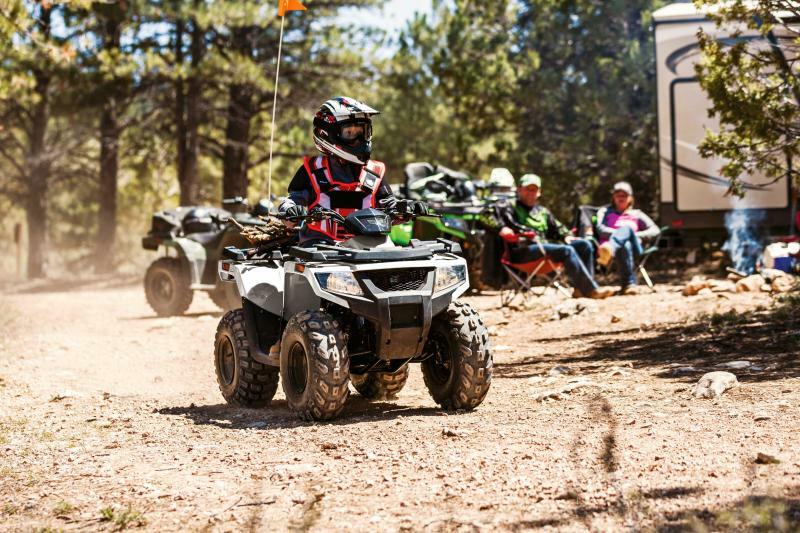 From choosing the right ATV type and size to information on the safety gear you need to use as we have previously highlighted in one of our recent articles, our short guide is committed to helping you identify the right vehicle for your kid. Today’s market offers a variety of ATVs designed to meet the needs of riders of different ages and experience levels. The first step to take in order to find the right four-wheeler for your kid thus regards the ATV type. You will find the so-called youth models that were designed with kids and teens in mind. Such ATVs come with specifications that ensure safe and comfortable riding. For example, the size of the engine is of great importance as far as the rider’s comfort and safety are regarded. Your kid should feel at ease when riding. For kids aged 6, a small engine that ranges from 48 cc to 70 cc is ideal as it will allow your child to engage in safe riding and provide the young rider with decent power. A too powerful engine for a kid is, needless to say, highly undesirable and unsafe. If your kid is over 10-year old, you can opt for an engine ranging from 70 cc to 112 cc. Such engines are ideal for young riders who have gained a bit of experience and want more power. 125 cc to 250 cc engines are ideal for teens and adults who want to go from a smaller ATV to a bigger and more powerful one. What’s above 250 cc is recommended for skilled adult riders. The engine size will directly affect the safety of your kid when riding. That’s not the only element to do so, though. There are many other aspects you need to take into account when choosing an ATV for your kid. Look for a model that comes with the following in order to ensure the highest safety possible. Go for a vehicle that has a covered battery, more precisely, a lock fastener that will cover it and that will prevent your kid from accessing it. A sturdy battery retainer is also needed to make sure the battery stays in place and does not move within the compartment. In case you want to buy an ATV with pedals, check out the braking system. It should be a safe system that will halt the vehicle automatically when the rider lifts the foot off the pedal. Consider the speed adjustment system as well. Many such vehicles come with two speed settings (low speed and high speed). Choose a model that has a concealed speed system in order for your child to be unable to change it. This way you can set it to low speed and rest assured that your kid won’t change it to high speed. Plus, quality materials won’t just ensure extended use but will directly affect the safety a rider enjoys. The power provided by the engine of an ATV is not the only aspect to consider, though. The ATV dimensions will contribute a lot to the safety and comfort your kid gets to enjoy when riding. Many parents tend to go for a vehicle that is one size bigger since kids grow fast and they would like the ATV to cover the kid’s needs for a long time. Avoid doing that as a bigger ATV might make it difficult for your kid to reach and grip the handlebars. What’s more, the wrong size might also give your young rider a hard time when trying to step on the brake pedals and accelerator. Also, you will find gas-powered ATVs and electric ATVs. Since we’re talking about a young rider, most probably with little to no experience, then you might want to opt for an electric option. If you choose a gas-powered ATV, be sure your kid rides with caution. Safety is definitely the most important aspect to consider yet comfort is essential as well. ATV riding should not only be safe but enjoyable, too. There are ATV models that come with extra add-ons. It is true that such specs will add to the final price of the vehicle but your kid’s comfort should have no price. However, if you are on a limited budget, you can still enjoy the desired comfort, or at least some decency as far as comfort is regarded, without breaking the wallet. Go for a vehicle that has a padded seat and even an extra seat for a friend if your kid is into sharing. This will encourage your little one to interact with greater ease. Well-tread, all-terrain tires are also ideal if you intend to let your kid use the ATV on various types of terrain. Extra storage to enable your kid to transport toys, too, is another feature that could come in handy. Last but not least, train your kid to ride the ATV safely or go for an ATV course before allowing your child to do that. 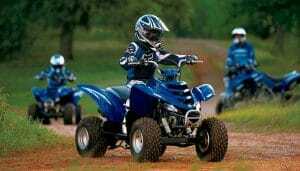 Young riders must be aware of the risks and dangers ATV riding involves. Plus, your kid should be physically and mentally capable of handling such a vehicle. Also, don’t forget to use the right safety gear including a durable helmet and safety goggles.